Carlos Maldonado's first four outings for the Royals in 1991 were serviceable, if not good. In 7.1 innings pitched, Maldonado struck out one, giving up two earned runs. His fifth, on July 19, however, would be different. The Royals already down 8-0, Maldonado was brought in to just get some outs. Of the eight batters he faced, only one of them was out. That one out was only because the Tigers' Tony Phillips tried to stretch a double into a triple, according to the wire account. Maldonado gave up seven runs, five of them earned in just a third of an inning. Over two seasons, Maldonado pitched in a total of nine games for Kansas City. July 19, 1991 was his last. 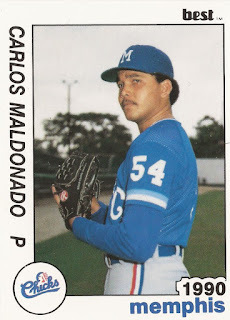 Maldonado had signed with the Royals in 1986, out of his native Panama. It took him through 1989 to do well enough at single-A to make the jump to AA Memphis for 1990. Maldonado then made another, larger, jump, directly to the majors as a September 1990 call-up. In four outings, he posted a dismal ERA of 9.00. It was back to the level he'd skipped for 1991 at AAA Omaha. He returned to Omaha after his disastrous seventh inning that July. After spending all of 1992 at AAA, the Royals traded Maldonado to the Brewers for another minor leaguer. In spring training 1993, Maldonado was part of a group of pitchers vying for a spot in the Brewer bullpen, according to the Milwaukee Sentinel. Four of the pitchers, among them Maldonado, were out of options, meaning they'd have to clear waivers he they were sent down again. "We're moving them up in games to make sure they face the tough hitters," Brewers assistant general manager Bruce Manno told The Sentinel. Maldonado made the team, pitching in 29 games that year with a slightly better ERA at 4.58. There was even talk in July of using him in save situations. He even recorded a save Aug. 15, against the same Tigers that pounded him two years earlier. But his final game with the Brewers and his final game in the majors would come Oct. 3. He hung on one more year with the Athletics at AAA Tacoma and Maldonado's career was done.